When a household deals with a bank, there is a clear promise by the bank, that the deposit will be redeemable at par with some interest that is known up front. But how is a household to verify that the promise will be met at future dates? Monitoring a bank every day is hard for unsophisticated investors. 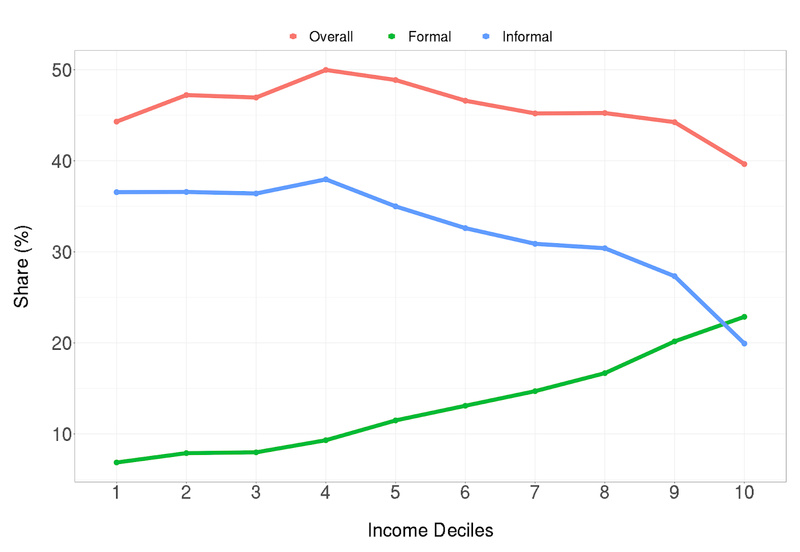 Unsophisticated households face asymmetric information, a market failure. In order to address this market failure, we do two things in financial regulation. First, we have micro-prudential regulation. The regulator coerces banks to bring down their failure probability to an acceptable level. A good thumb rule for Indian conditions is to aim for a failure probability of 2% on a one-decade horizon. This requires two elements of work: forcing banks to mark their assets to market so that bad loans are valued at fair market value, and a leverage rule which caps the leverage of banks. Second, we require a Resolution Corporation to deal with bank failure: a specialised bankruptcy process, which pays out deposit insurance to households (Rai, 2017). This is the well understood regulatory apparatus that is brought into play when banks borrow through bank deposits, which go alongside high intensity promises. 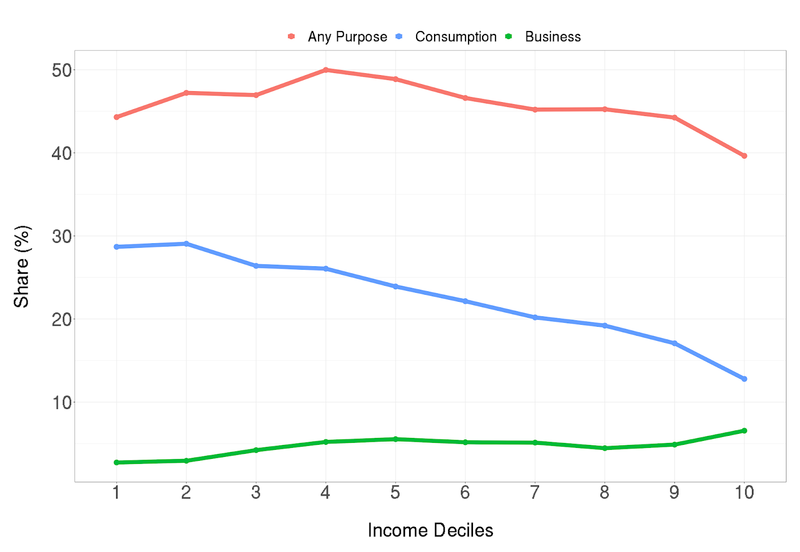 How should we think about households and investment in securities (equity or debt)? Conversely, what should a financial regulatory apparatus do when a firm (a bank, an NBFC or a non-financial firm) wants to issue shares or bonds on the primary market? A key difference on the stock market or the bond market is the lack of a promise. No promise is made, either about liquidity or about the price at which a future transaction will take place. This immediately improves the situation from a regulatory standpoint. Investors walk into buying bonds or shares with their eyes open, no promises are made to them. Hence, we do not need to worry about micro-prudential regulation of the issuer when an investor buys shares or bonds on an exchange. What about the primary market? In a primary issue, there is the risk of an advertising campaign that makes lurid promises to unsophisticated investors. This is addressed nicely by having a rule which requires that a minimum x% of the primary issue (of either bonds or shares) be purchased by sophisticated investors, and these investors be locked in for a certain short period. A good definition of a `sophisticated investor' for this purpose is a person who invests a minimum of Rs.10 million in the issue. Once the issue passes the market test of appealing to such investors, it is safe for households to participate directly in the primary market for securities. Under such conditions, the gatekeepers for resource mobilisation through the primary issuance of shares or bonds are sophisticated investors and not the state. If a firm had poor prospects, or mispriced its securities, it would not get the support of these investors, and the issue would fail. How much leverage, and what debt characteristics, are appropriate for a highway or a steel company or an NBFC? There is no need for the government to get involved in terms of micro-prudential regulation or interference in the price. The only role of the state is in the adequacy and truthfulness of disclosures that are made at the time of the issue. As there is no high intensity promise by an NBFC, failed NBFCs should go to the ordinary IBC process. The need for the Resolution Corporation, in handling firm default, is only when a systemically important NBFC fails. When a bank borrows using the bond market, this changes the overall leverage of the bank, and the bank would of course have to comply with micro-prudential rules that cap its leverage. But there is nothing special about the primary issue of a bank, when compared with the reasoning above. NBFCs in India are facing many difficulties. However, micro-prudential regulation of NBFCs is not the answer. There is no need for the state to get involved, or engage in micro-prudential regulation, of bond issues by banks, NBFCs (Roy, 2015; Shah 2018) and non-financial firms. The sophisticated investors on the primary market are the gatekeeper; unsophisticated households free ride on their price discovery. The Companies Act should not interfere in the bond issuance of companies, and RBI should not micro-prudentially regulate NBFCs. The reticence of the bond market in lending to some NBFCs, from August 2018 onwards, is market discipline at work. The regulatory difficulties of NBFCs in India, Shubho Roy, The Leap Blog, 24 December 2015. Movement on the law for the Resolution Corporation, Suyash Rai, The Leap Blog, 19 June 2017. Financial regulation for the Fintech world, Ajay Shah, The Leap Blog, 21 March 2018.
by Surbhi Bhatia, Manish Singh, and Bhargavi Zaveri. Since the enactment of the Insolvency and Bankruptcy Code (IBC) 2016, studies undertaken to estimate the insolvency resolution time have provided varying estimates. As part of the World Bank's 'Ease of Doing Business' outcomes 2018, the estimate for time taken to resolve insolvencies in India is approximately 4.3 years. Felman et al. (2018) survey the 12 large cases referred for resolution under the IBC by the Reserve Bank of India in 2017, and find that while the larger cases have been in resolution for more than 500 days, the smaller cases are also taking up to 350 days from the date of admission by the National Company Law Tribunal (NCLT). Shah and Thomas (2018) present a survivor function on the cases admitted at the NCLT and find that at the end of 270 days, there is an 80% probability of a case still ongoing. We build on this approach to estimate the time taken in insolvency resolution processes triggered by different kinds of litigants and before different benches of the NCLT. Our findings have three direct implications. First, estimation of survival function using case level data provides an empirical methodology for measuring time taken to resolve cases. Second, the probability of case completion within a given timeframe, thus computed, allows stakeholders to plan their affairs and resources appropriately. For example, a probability estimate of an insolvency case seeing an outcome within a certain timeframe offers valuable information to a creditor on making a strategic choice of settlement or pursuing resolution. Third, for policymakers, our findings offer insights into the manner in which the eco-system of stakeholders under the IBC, is evolving over time. We find that the probability of seeing an outcome within 180 days from the date of admission is less than 5%. However, it picks up once the 180 day deadline is passed. Within 270 days, the chances of case closure are between 10 to 30% depending on the bench and case characteristics (e.g., creditor type). We observe high closure rate just past the 270 day period. Within 360 days of admission, the probability of seeing an outcome is significantly higher (30 to 70%). Quicker outcomes (liquidation or resolution) are observed for resolution proceedings triggered by the debtors themselves. Similarly, proceedings triggered before some benches result in resolutions speedier than those before some others. The IBC provides for a linear process for corporate insolvency resolution beginning with the filing of an insolvency petition before the NCLT. Once a petition is filed, the tribunal can admit or reject it. If it is admitted, a creditors' committee is constituted and a timeline of 180 days is provided for the submission of a resolution plan. If no resolution plan is submitted, the NCLT is required to pass an order for the liquidation of the firm. The timeline of 180 days is extendable to 270 days (in exceptional circumstances), with the approval of the NCLT. These two sets of timelines provide a natural setting for conducting the analysis. We track all the cases that are admitted by the NCLT from the date of their admission until the date of the order of the NCLT either approving a resolution plan or directing the liquidation of the debtor. 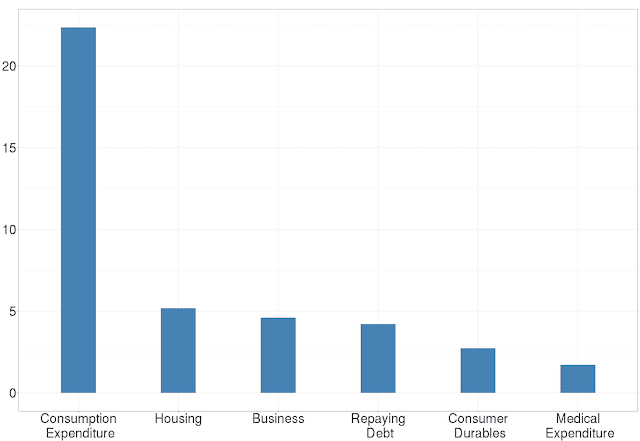 For our analysis, we use the Finance Research Group Insolvency Dataset on cases filed before the NCLT. We combine this with data on outcomes of cases published by the Insolvency and Bankruptcy Board of India (IBBI) for admitted insolvency petitions. The result is a dataset of all the insolvency petitions admitted by the NCLT. Our study period extends from December 1, 2016, until June 30, 2018. The data provides information on case ID, the bench at which the case was filed, who filed, type of creditor, the date on which the insolvency petition was admitted, and the date on which the final order was passed (resolution or liquidation). We compile this data for eight out of the nine benches (Ahmedabad, Bangalore, Chandigarh, Chennai, Hyderabad, Mumbai, New Delhi and Kolkata) of the NCLT that were functioning during the study period. Information on Guwahati bench is not recorded in the dataset. Our final sample consists of 761 admitted cases. Table 1 shows the time taken by the closed cases, as on June 30, 2018. It is observed that 24 cases across all benches were closed within the first 180 days of their admission. 73 additional cases got closed between 180 and 270 days of their admission. If we extend the timeline by another 90 days, 62 more cases get closed. As on 30th June 2018, we find 76 cases which are ongoing for more than a year. Table 2 shows details of the cases admitted during the study period, across the four benches of NCLT with the highest workload. 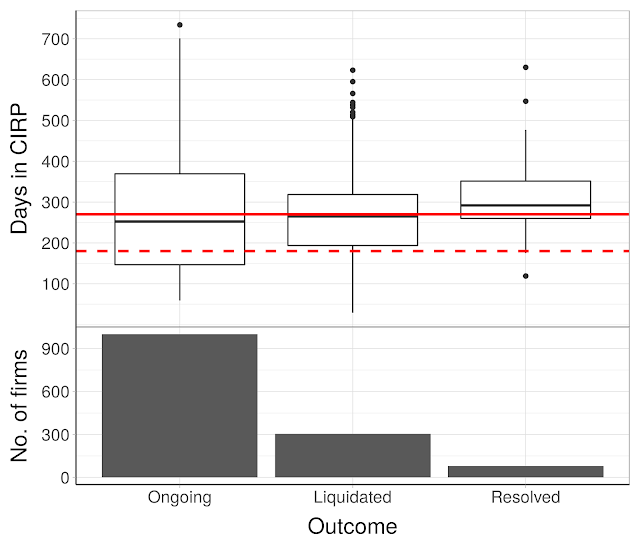 It outlines the number of cases admitted together with the outcome (whether liquidated or resolved). 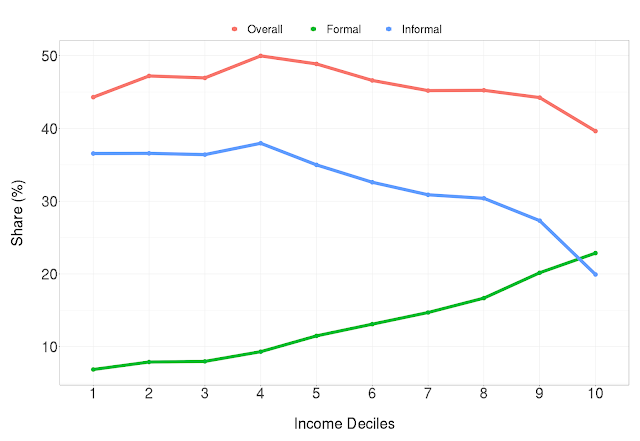 To reduce the upward bias, for the closed cases, we also show the median time taken to reach the final outcome. We find that the median time varies between 200 and 280 days depending on the bench. While summary statistics of this nature are useful, they do not offer any insight on the probability of a case having an outcome within a given timeframe. In the past, survival analyses have been used to understand judicial delays in tribunals (Datta et al. (2017)). While the same principle could potentially be applied to understand judicial delays for cases under IBC, there is a critical difference between cases before the NCLT under the IBC and cases before other quasi-judicial tribunals. This distinction stems from the resolution process being led entirely by the creditors and other stakeholders with limited touchpoints with the judiciary. For this reason, case completion within the timeline of 180 or 270 days, cannot be attributed to judicial delays alone. In the absence of more data on the time spent in litigation during the different phases in a resolution process, a survival model cannot be directly applied to analyse judicial delays under the IBC. Therefore, applying the survival model contextually to the IBC will yield findings on the duration that the entire resolution process takes. From the date on which an insolvency petition is admitted, we track the case up until 30th June 2018. For the purpose of this study, we define the event as case completion, resulting in resolution or liquidation. The event variable is equal to 1 if the case got closed within the study period and 0 otherwise (still ongoing). The dependent variable is the duration for which a case remains open. For cases which saw a definite outcome, the duration is calculated as the difference between the admission and the outcome date. For ongoing cases, the duration is the difference between admission and analysis date (30th June 2018). The probability of case completion within 180 days is less than 5%. The probability of case completion within 270 days is 22%. The probability of case completion within 360 days is 45%. 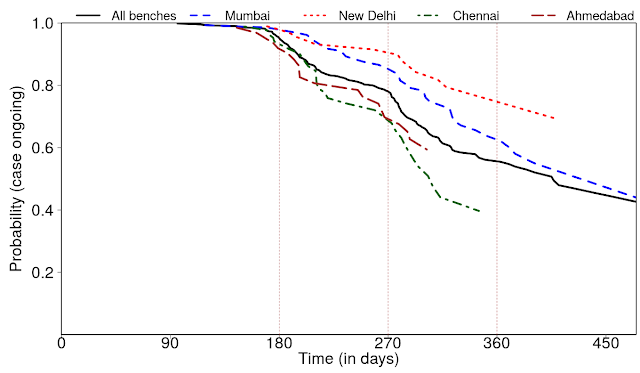 Comparing across benches, we see that the survival curves for Mumbai and Delhi lie above the national average, thereby indicating a much lower probability of a case closing at either of the benches. At the end of 270 days, the probability of case closure at Ahmedabad and Chennai bench moves upto 30% while it stays at 14% and 8% for Mumbai and Delhi respectively. Within a year's time, the outcome probability is 60%, 41%, 36%, and 21% for Chennai, Ahmedabad, Mumbai, and Delhi respectively. Table 3 shows the estimated survival probability (with 95% confidence interval) at various reference points (180, 270 and 360 days). A narrow confidence interval suggests that the observed survival probability is very close to the estimated one with minor deviations. For 180 days, confidence intervals are narrow for all benches, suggesting near zero probability of case completion. Moving to 270 days, the variations widen. The survival probability drops considerably for Chennai and Ahmedabad, but the confidence intervals widen. This points towards increased fluctuations in the duration of completed cases. We find a similar trend across all benches as we move to 360 days. For the reasons explained above, the probability estimation cannot be attributed to the judiciary alone as the resolution process is driven by the creditors' committees. The actual time until the outcome will depend on various factors such as the complexity of the case, the size of the debtor, the composition and number of creditors on the creditors' committees, and the propensity of the creditors or the debtor to litigate. Firm characteristics also differ across jurisdictions. So variation in duration across benches should not be interpreted as the lack of judicial capacity. The lower probability of a faster outcome before the Delhi and Mumbai benches of the NCLT may be related to the complexity of the cases handled by these benches. The inference made above is corroborated by Figure 2 and Table 4, which depicts the probability of case outcomes for different type of litigants. 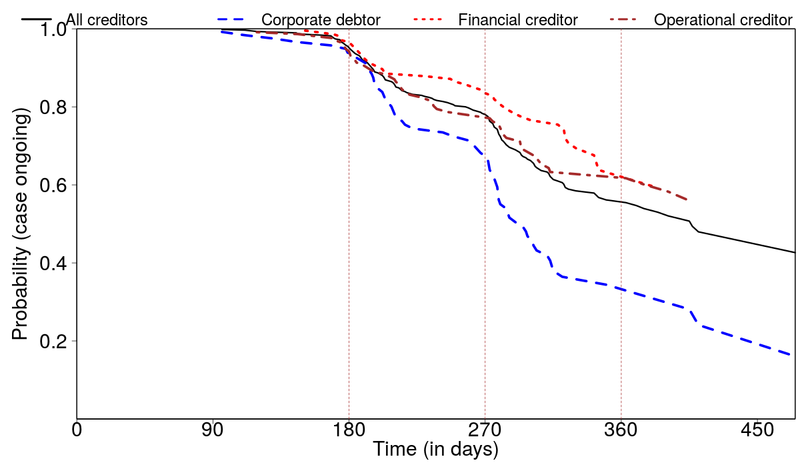 Cases which are filed by corporate debtors are more likely to see earlier outcomes, relative to cases filed by creditors. The probability of insolvency triggered by a debtor seeing an outcome within a year of admission of the petition is 70%. On the other hand, where the petition is filed by an operational or financial creditor, this probability drops to 40%. By analysing the data relating to cases that have undergone the IBC process in its entirety, we put forward a new approach to understand time to insolvency resolution. Using survival analysis, we estimate the probability of a case ongoing across different reference points. The methodology is robust to censoring. 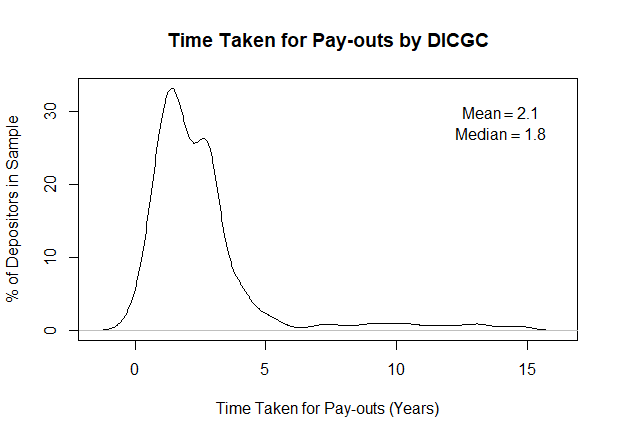 Case dropouts on account of reasons such as settlement or withdrawal will simply modify the probability distribution of duration. Since we don't have censored observations at the time, our point-in-time estimate is just the empirical distribution of the duration. This analysis can also be extended. With a more detailed break-up of case-level data, it is possible to use this framework to estimate the time taken across different phases of the resolution process. This will be suggestive in bringing into focus the bottlenecks in the process. A time-varying analysis can also be used to evaluate institutional performance. If the probability of timely resolution consistently increases, this implies that the institutional eco-system is evolving in the right direction. This measure will be especially important for tribunals which are set-up with a speedy disposal in mind. The RBI-12 cases under the IBC by Felman J, Marwah V and Sharma A, Working paper on file with the authors, 2018. 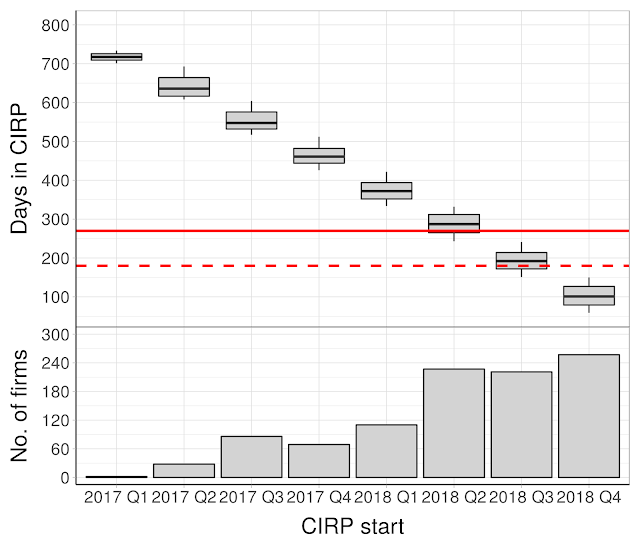 The Indian bankruptcy reform: The state of the art, 2018 by Shah A and Thomas S, 22 December 2018, The LEAP blog. Understanding judicial delay at the income tax appellate tribunal in India by Datta P, B.S. Prakash S and Sane R, Working Paper 208. National Institute of Public Finance and Policy, 2017. The authors are researchers at Finance Research Group at IGIDR. They acknowledge useful discussions with Ajay Shah, Susan Thomas and Anjali Sharma.